I used to like Honey Shreddies but can’t find them any more. Do they still do them? Sainsburys strawberry granola, £2 for a kilo bag. If I'm feeling fancy I'll go for some of the Jordan's granola (raisin and almond one normally). Whatever gluten free cereal I can find. Rice crispies + caster sugar = Ricicles. I rarely eat breakfast. If I do have cereal it's normally chocolate pillows (Lidl's own version of krave). The amount of sugar some of you must consume. I buy it pretty much for the flag alone. Brexit Britain. KK wrote: I used to like Honey Shreddies but can’t find them any more. Do they still do them? Pretty sure I read that they'd been discontinued. Shreddies and Weetabix in the UK. Kroger store brand Cocoa Puffs in the US. I used to like Honey Cheerios, until they changed the recipe, and now they taste as gooseberry fool as the rest. Lotus wrote: The amount of sugar some of you must consume. I always have Weetabix, it's been that way for as long as i can remember. Shredded wheat bite size or raisin wheats or Tesco’s version of Special K.
Still have a fondness for sugar puffs but that’s the only sweetened cereal I like. I actually love muesli and branflakes. Just don’t have them often enough. 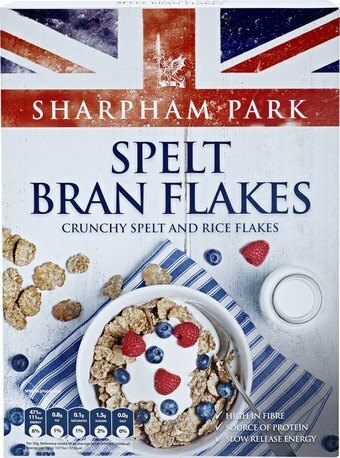 Bran Flakes (Tesco or Asda), enough to clear your system. Might as well have some chocolate biscuits for breakfast, etc. Hey I'm here for a good time, not a long time. Special K with blueberries. Sometimes Lucky Charms. I make my own granola and mix up the flavours whenever I feel like it. Porridge for me, usually with banana but Ill sometimes add berries or honey. I very rarely have any breakfast. If I do it’s usually toast. My son loves Hoops (Aldi knockoff version of Cheerios) though.